This joint shows up fairly regularly in books that document joinery and it seems to be predominately utilized in timber framing applications. Even so, I have wanted to explore this joint for a while and see if it would lend itself to furniture building. Given that I tend to “color outside of lines” with my designs, this joint may prove handy in solving a problem or two that may crop up. As its name implies, the tenon is shaped as half a dovetail and the mortise is chopped and pared to match. The entrance side of the mortise is matched to the height of the tenon. The exit side of the mortise is enlarged with a sloping floor that allows the dovetail tenon to engage the mortise. 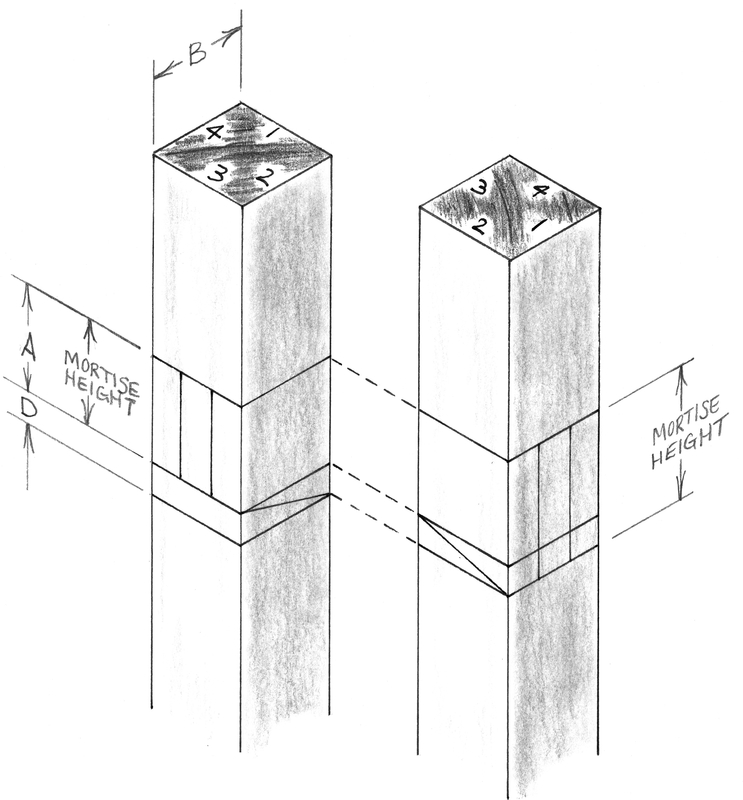 The creation of the sloped floor and seating of the tenon results in gap between the top of the tenon and the roof of the mortise. Wedges are then used to secure the assembled joint. The joint gains strength from the engaged dovetail tenon and the compression that is applied with the wedges. When properly executed, the joint will draw up square and, in theory, should draw an assembly square without the need for clamps. One of the unique advantages of this joint is that it can be disassembled with relative ease. Making it very useful for something along the lines of a trestle horse that can be taken down and transported. For furniture applications I see more of a permanent assembly being in order. Once the wedges are secured, I’ll cut them flush. 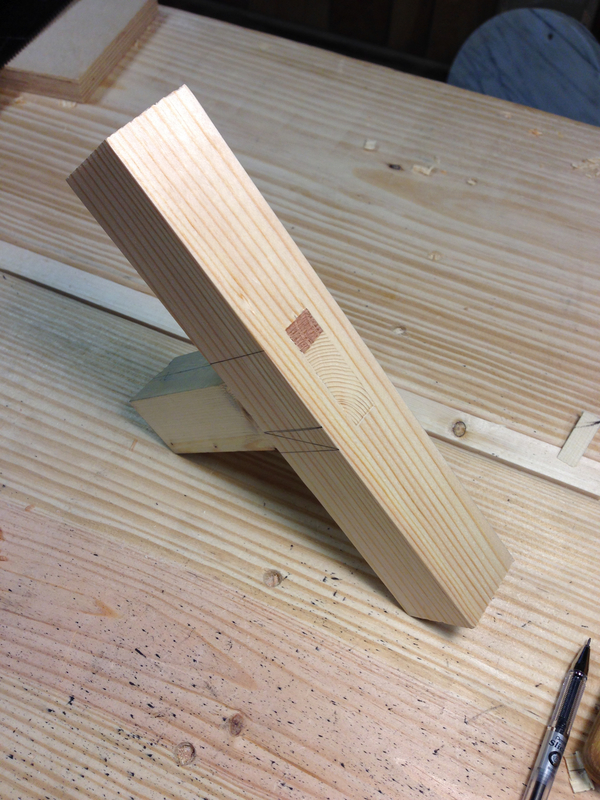 To execute this joint, as with any mortise and tenon, I started with the layout of mortise. 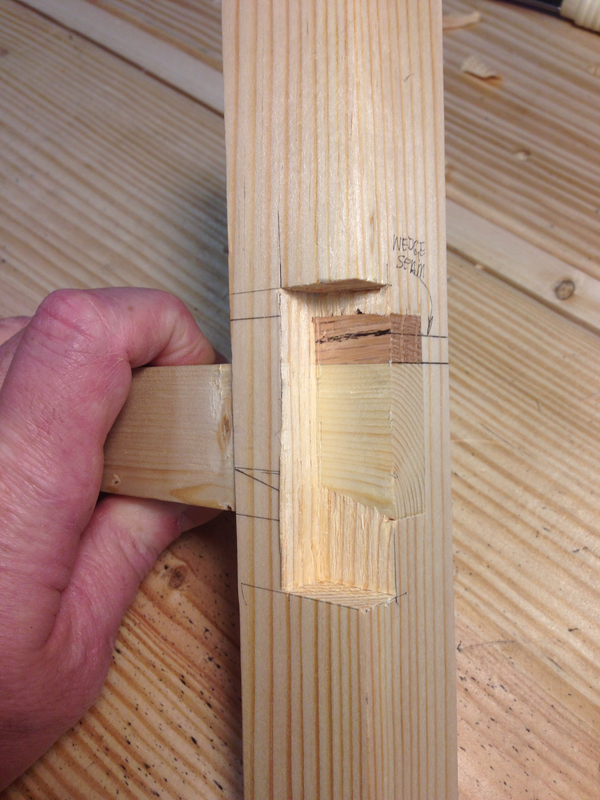 First the height (A) of the tenoned piece is marked around the piece to receive the mortise. 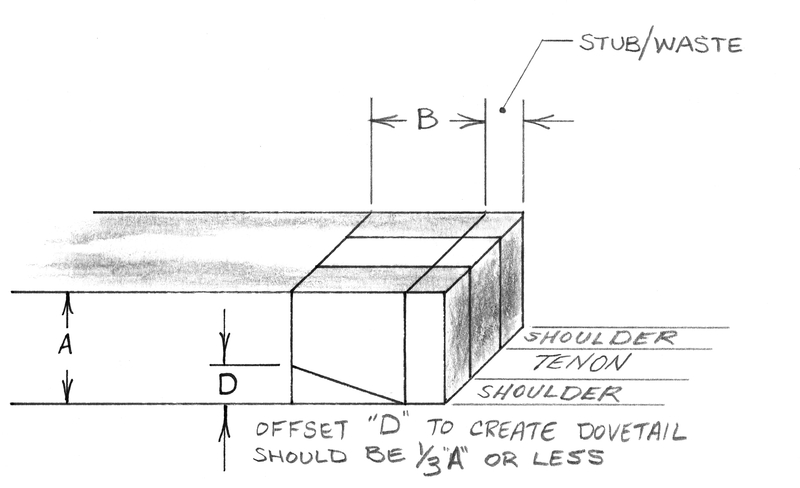 Once that is established the offset (D) is determined and marked on the exit face of the mortised piece. Non of the references that I found gave any guidelines as to depth or angular degree for the offset that creates the dovetail. I noted on my drawing above that the offset should be 1/3 the height or less of the tenoned piece. Be aware that this is an arbitrary guideline of my own making. Generally, it seems to make the most sense for strength and will help with consistency when I use this joint. Specifically in furniture sized workpieces. With height and slope established, I marked out the width of the mortise based upon the rule of thumb that the mortise should be no wider than 1/3 the thickness of the material. For the joint to be effective the tenon must me shouldered. 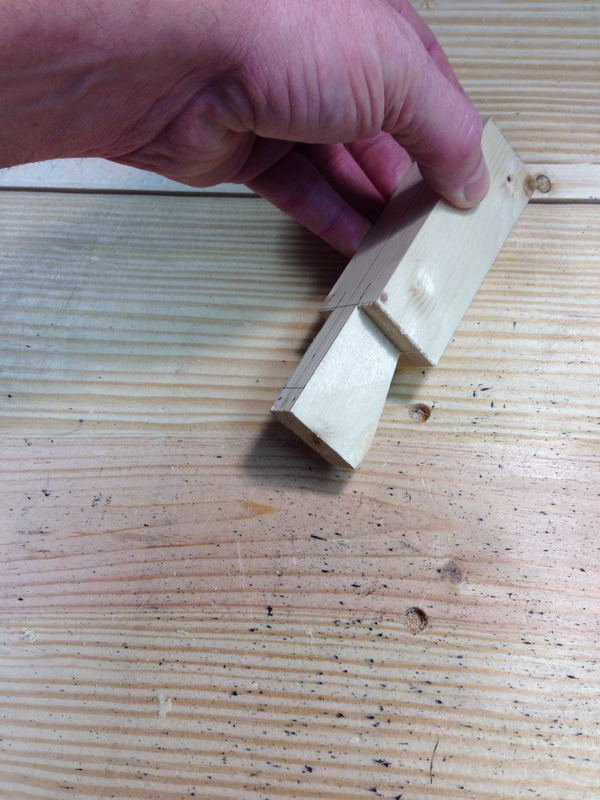 This point may play a role in determining the width of your mortise. So keep it in mind. Next up is the layout of the tenon. Obviously the width and the offset (D) need to match that of the mortise layout. The length of the tenon should long enough that the tenon will protrude thru the mortised workpiece. How much it protrudes is not important unless it plays a role in the intended aesthetic design of the overall piece. So the tenon length is the depth of mortised piece (B) plus a little bit more. At this scale 3/8″(10mm)-1/2″(12mm) seems about right. With the layout complete I chopped the mortise. First chopping a square thru mortise and then chopping and paring the sloped floor. I then began work on the tenon. First completing all of the rip cuts so as to preserve the layout lines. The second operation was to saw around the shoulder freeing the cheeks and the sloped section to establish the dovetail. Which brings me to the wedges. The references to this joint typically show it secured with a single wedge. 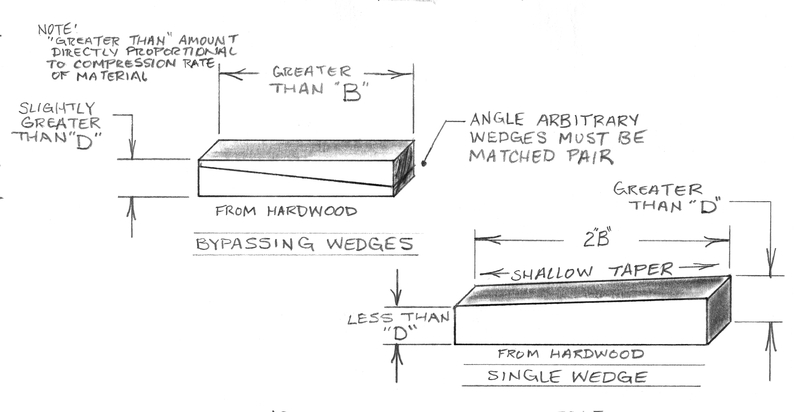 The bypassing wedges are an extra step that will result in uniform compression across the tenon. The second advantage is that, if sawed flush, there are no gaps between the wedges and the top of the mortise, either on the exit or entry side of the joint. Either wedge configuration will work though. Assembly is straight forward. Insert the tenon, seat the dovetail and install the wedges. A good bit of force can be used when installing the wedges without fear of destroying the workpieces since the compression created by the wedges is against the end grain of the mortised piece. A surprising amount of force actually. Finally a look at the joint with the wedges and stub of the tenon cut flush and planed. Opened up to show the internals. Will I use this joint a lot in my furniture designs. Probably not, but it will prove very useful to know when a design dilemma calls for it. This entry was posted in 6-Joinery, Bind Dovetail Mortise and Tenon and tagged dovetail, end grain compression, mortise and tenon, wedge. Bookmark the permalink. I’m curious about whether two wedges are better than one, or not. Your point about equal compression is good. Would seasonal wood movement be an issue, magnified by there being 3 rather than 2 different pieces of wood in that mortise? Speaking of which, could the grain orientation be altered in the wedges to mitigate against that? I can see where your headed but…the simplest way to make bypassing wedges is to create a rectangular piece and then saw a diagonal. So now we are back to two pieces of wood, not three. Take a look at the last photo of the flush cut. There are two wedges there. Can you see the seam where the two wedges meet? I have wedged a lot of tenons, none of them have opened up gaps or loosened in any way. So my best guess is that it is a non-issue. My belief is that the compression generated by installing the wedges exceeds the shrinking distance of the material. At least in furniture scale joints. One more thing…referencing the same photo. Note the amount of compression between the wedges and the tenon. The wedge and the tenon started out square. The compression is so much that it altered the shape dramatically. Thanks – I’m at a better monitor now and looking at that last photo zoomed in much closer than I could see with my eyes if I had the piece in front of me. I still can’t see a seam. Just for fun (you know, if you’re bored or something…), I think applying a dye to one of the two pieces of the wedge, highlighting the seam, would be interesting to see. I’d also love to see the final result from the hidden side. I added a photo at the end of post that shows a cut-away section. I had to get a magnifying glass to find any trace of the wedge seam and marked it to the best of my ability. I also looked up the shrinkage rate for this material and size. Works about to be about an 1/32″ with an 8% moister swing. Progressively less as you move up the slope of the dovetail. So I’m not too worried about it loosening up over time. Hurts my brain, but that’s why you’re on my favorites bar. LOL…it is really a simple joint to make. Give it a try. The joinery is interesting. Don’t know if I will use it sometimes, but your post widens the horizon. I won’t use this joint a lot in my furniture making either, but I think it’s worth knowing how to make it. If for nothing other than skill building. That cut-away is awesome – thanks for adding that! Nice work. I used that joint years ago, to secure the stretcher on a large Shaker-style trestle table that has been knocked down for traveling many times. With the dovetail on the upper side, and a single wedge underneath, shouldered only on the dovetail face. The joint will succumb to racking if we slide it around the room a lot, otherwise surprisingly strong, light and stable. 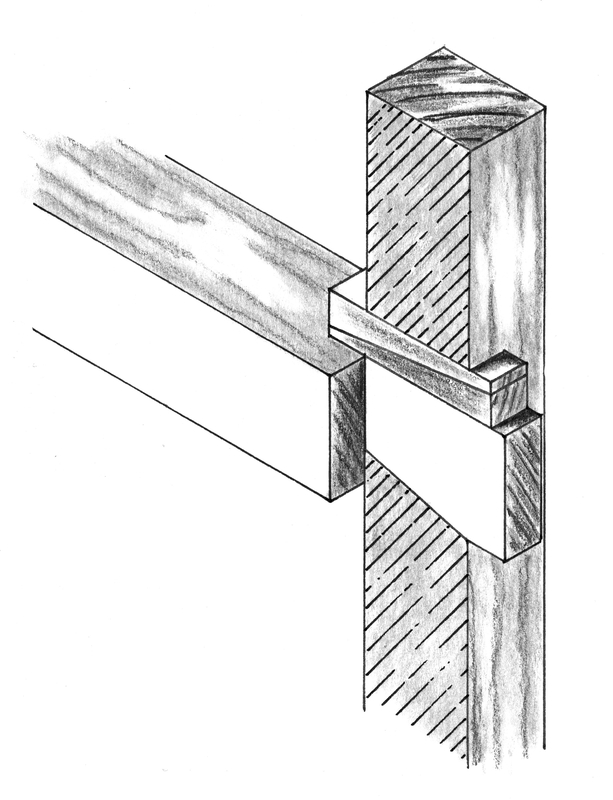 Timber framers use the term “relish”(slightly mis-spoken French) to indicate the wood in a joint that is susceptible to shear failure, e. g. where mortice cheeks are likely to split out if this joint were at a corner, or where pegs might shear out the end of a too-short tenon. The English framers call those “folding wedges”. It seems like a handy joint to have in the arsenal. Folding wedges…I learn something new with a lot of your comments and, as always, appreciate it. My gently used copy of “English Historic Carpentry” came today. You were right, the illustrations are fantastic. I’ll be reading thru as soon as possible. David Pye inspired me years ago to believe that we should have a common language of clear and precise terminology in our “workmanship of risk”. Dang it! There is another book or two on my reading list that I have yet to get to. Terminology is something that I find myself struggling with. Pulling methods and forms from multiple cultures creates issues. Trying to decide if common english terminology can be used without loosing the original identity of the cultural source. The fact that I am learning as I go doesn’t help either. Great post, Greg. I’m really enjoying these joinery articles. I hope they are of some use. If nothing else they are a good way to practice layout and sawing to a line. Hi Greg, excellent workmanship on this joint. It’s a good one to know, especially for timber framing. I used it some in my house building days. Anyway, this is not meant as a criticism. I’ve been reading your blog for a while now and really enjoy seeing your work and reading what you have to say. Keep up the excellent work. Thanks for the link Tom. I’m fine with criticism too. 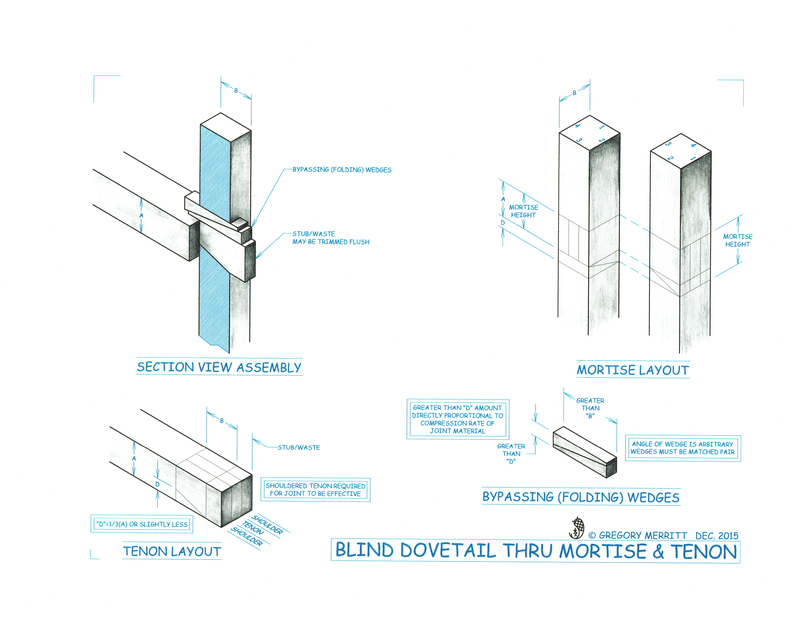 “blind half dovetailed thru mortise and tenon secured by wedge”. Like I commented to Michael above, working across multiple cultural lines creates some issues. I see that this is going to become an ongoing problem and I’m trying to work out a workable solution so as not to create further confusion. Your link will be useful in that regard.